Today's Saturday but it wasn't an off-day for me. I still had to ferry the kids to school for their replacement school day. As usual, for the past week, I'd get up at 6.00am, fetch the kids one by one from their homes and dropped them off at school by 7.15am. Then in the afternoon, I'd pick them up again from school and dropped them one by one back home. T'was like the days when I had to ferry Nick to school but back then, I had to couple it with rushing myself to work. I still remember the stress then. Gladly this time, I've adjusted well into the routine with a laid-back feel ... no pressure whatsoever. This morning, I added alittle dash of adventure to my morning routine. On the way home, I went to the market, did some groceries and breakfast-hunting for my 2 heroes who're still snugged in their bed at home. It was fun as I've not done this for such a long long long time. Comparably it wasn't as fun back then as I was always in a rush. Coincidentally, I bumped into an ex-colleague, Cindy who was doing her marketing too. Caught-up with each other for awhile by the roadside before bidding 'ta-ta' ... I'm sure we'll meet again, probably sooner than expected. Driving back, I felt good, accomplished and alittle surprise at myself too for breaking away from monotony. I realised that I've been living pretty much in a cocoon for quite a long while now ... 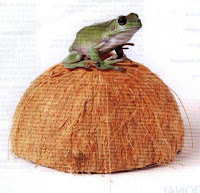 I was like a recluse or as with the Malay proverb, "Seperti katak dibawah tempurung" literally translated, 'like a frog underneath a coconut shell' ... I'm practically like the frog, ignorant of things, events and places outside my world. Breaking the monotony this morning certainly will not be the last ... I guess this must be one of those little little changes to be expected inside the new chapter of my life. You know, stories like this are so beautiful :-) I love to do that to my girl and hope I'll get the chance to surprise her with some yummy food while she's sleeping like a princess :-) Thanks for reminding us, that it's the small thing in life that matter. Katak dibawah tempurung definately for me too, so absorb in our own working world we didnt realise there's a bigger world out there.... and you just reminded me to wake up and smell the roses. THANK YOU! @MKL: Sometimes we're just too engrossed with meeting big expectations ... expectations that we think our loved ones expects of us, that we forget the little little things that can give them more satisfaction, contentment and enjoyment. Hi Lily, after working for almost 30 years before calling it QUITS, the wisdom gained is that, "all work and no play makes Jill a dull girl". Don't wait till you reach my age to realise the joy of living a fun life. Though not too late for me to start now but for you, why wait? Same here, I thought I could sleep in late but the boys had replacement classes and even though I gave them permission to skip school, my younger boy INSISTED on going ... darn him ... LOL! Having a slow and monotonous life isn't always that bad. Especially after a hectic week at work.